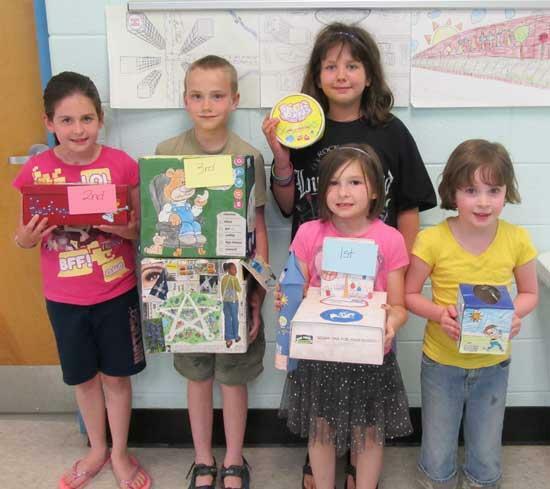 Auburn School recently held a contest to create Collection Boxes to help the school in collecting Box Tops for Education. The contest came to a close on Friday, April 15th. Pictured from left to right are: Carly Brown (2nd Place), Ethen Powers (3rd place), Isabella Russo, Kiley Hughes (1st place), & Olivia Robbins. Box Tops for Education is a program which allows schools to get families and communities involved in the fundraising process by collecting Box Tops off of General Mills products. Thank you to these students and General Mills for the opportunity to do this for our school. You can also help your local schools by registering your Kroger card at www.rewardyourschool.com.